This research explores the potential of cut flower production as an alternative source or replacement for tobacco income. 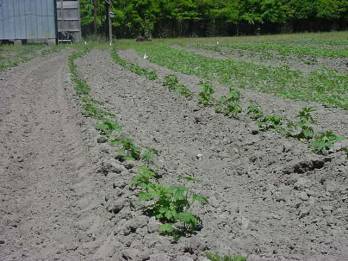 A variety of species and markets were investigated for suitability and profitability for growers in North Carolina, and several have shown promising results to date. Test crops of several specialty cut flowers have been grown on the Kennedy Farm in southern Lenoir County, formerly a thriving tobacco farm. Most cut flower varieties were started in the greenhouse and planted in the field: gomphrena, achillea, asclepias, zinnia, delphinium, shasta daisy, blue kiwi, cosmos, scabiosa, and helipterum. 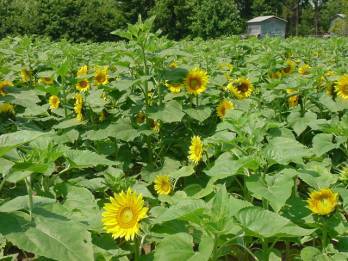 Sunflowers were the exception as they were directly sown in the field. A large population of worms stopped the sale of sunflowers because of concern for the quality of each stem sold. Deer damage to the helipterum plants was significant-they were pulled completely out of the soil. Cuts were harvested and marketed at local florists and a farmers market with the majority of sales made through wholesale florists. Marketing through grocery chains was explored and shipping supplies designed and purchased. The top four sellers providing over $3000 in gross sales were sunflower, delphinium, achillea and zinnia. Specialty cut flowers can provide some income to farmers. Continued research is needed to establish markets and determine suitable varieties. 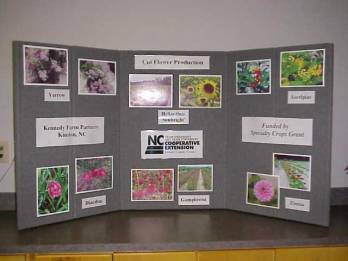 North Carolina growers can benefit from production of specialty cut flowers but only for a limited number of farms. 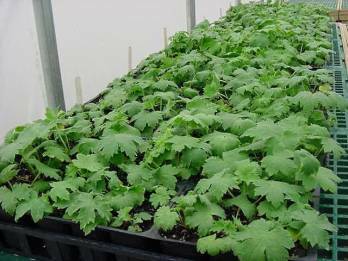 The choice of floral species grown is a dynamic process due to fluctuating demand. Marketing is definitely an essential component in gaining income from cut flower production.